TIVAR® is a thermoplastic material developed for the use in extreme conditions. Due to TIVAR®'s high molecular weight it is extremely wear resistant. It exhibits excellent sliding properties because of its homogeneous and waxy surface. 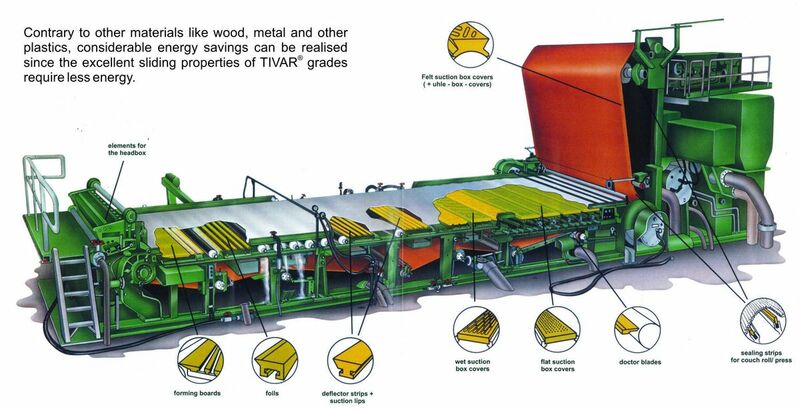 Therefore TIVAR® is most suitable for dewatering elements in paper machines. These specially developed material grades have been successfully used by both manufacturers of paper machines and paper mills in more than 40 countries. Many years of international experience made TIVAR® a specialist material for dewatering elements in the paper industry. Extensive research and development work in laboratories creates permanently new compounds to meet the steadily increasing requirements of modern paper machines. Many of the compounds are patented. New production technologies enables us to fabricate dewatering elements up to 10m lengths. The lifetimes of fabrics and dewatering elements depend to a large extent upon the gliding of the plastic used. TIVAR® has an extremely low coefficient of friction. By using gliding additives the coefficient of friction of TIVAR® DS and TIVAR® Ceram P is further reduced. This cause good functioning properties of the fabrics even in connection with the covers and blades, which are installed in the much drier portion at the wet end section. The non-porous, waxy surface of TIVAR® prevents build up of fibres and other components. Special compounds are available for various operating conditions. Contact our engineers for assistance in choosing the correct material grade for your specific application and operating conditions. Slot and hole patterns are fabricated in any design at the most competitive prices. Five standard designs are available to choose from. For years the paper industry has been using Mitsubishi Chemical Advanced Materials® plastics to manufacture dewatering elements. Wooden suction box covers and other plastic covers have been replaced by Mitsubishi Chemical Advanced Materials® plastics, which offer the only logical alternatives to ceramic materials. Mitsubishi Chemical Advanced Materials offers many alternatives to withstand extreme conditions in modern, high-speed paper machines.